After a big month for the squad we are treated to a weekend of BUCS with Jonathan Davies (Birmingham) featuring in the 1500m final having qualified through the heat and semi. There might also be a defence of his 5000m (13:25) title too. Lydia Blythe (Edinburgh) put in a great performance but unfortunately did not make the final. JD leading 1500m Semi Final. As the squad transitions from XC to Track there have been a few good earlier performances and Reading AC proving a dominant force in the YDL (Youth Development League). British Athletics League and Southern Mens League is also beginning to kickoff. During the London Marathon Events we had 3 athletes competing. 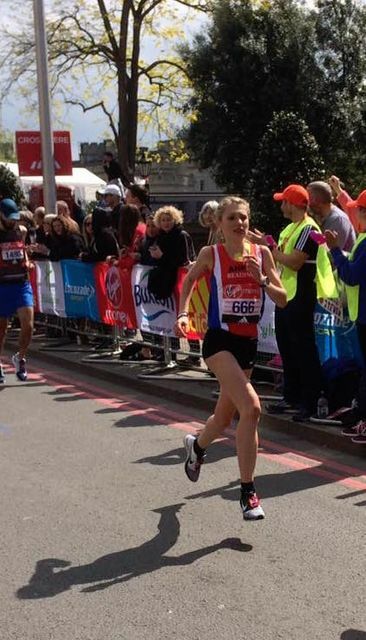 Chey Kemp and Kirsty Walker were 21st and 19th respectively in the Mini Marathon. The event pulls together the best across the country in a shorter distance. Chey and Kirsty each in the scoring team of 4 for the South East and both teams were second. Early days moving from XC and congrats to Kirsty for finishing 9th in the UK during the XC season. Up next was Anna, spoiler alert below however I would recommend reading her full blog here. Anna started in the mass start which also doubles up as the England Athletics Championship. If you watched on TV you would have seen a set of women start before the mass race, these were the elite women who are picked based on prior performances. They are separated from the men so their times are unassisted and this weekend Paula Radcliffe's world record was broken. Anna was the 5th British women to cross the line overall and won the mass race in a 9minute PB of 2:37:07. "...talent can only take you so far. Be prepared to put in the effort. learn and 'be brave '( Anna's slogan) Reach out of your comfort zone to find what you are truly capable of achieving in sport and in your wider life..."
Back to some more evenings down by the river in Reading or on Palmer Park Athletics track as the group chases international vests. Good luck to JD in BUCS Finals. Mile 24- "Who am I? This hurts so much. A horrifically slow mile. I" can't even see Big Ben" I hear my Dad in the crowd. "Make Dad proud, prove to him you can do this". Mile 25 - Birdcage walk is tunnel vision. "How is this so far?" Mile 26 into the mall - forget to wave to the Queen. JUST FINISH. The finish - I can’t see. I can’t hear. I can’t really stand either. A brief trip to the medical tent and then I cry. 2.37.07 and winning the championship race. I couldn’t believe it. Nearly a 9 minute PB.